Audi in its entire lineup has various models that’ll steal your heart away but hearing name of S3 Saloon will take the entire accolades. Undoubtedly it has been a model drenched in luxury and dipped in power with its total output of 300 hp and peak torque 380 nm. But wait!! ABT Sportsline just played a little with this already powerful model and gave a commendable rise to its performance figures; want to know more? 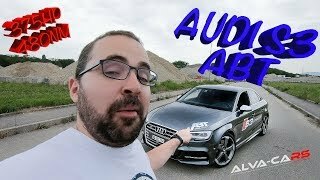 Let’s check review of ABT Audi S3 Saloon 2014 and learn more about this modified package. ABT is known very well for playing with the heart of a model and in turn giving treat to hearts of automobile lovers. Here we have ABT Audi S3 Saloon 2014 which also gets some aerodynamic upgrades and thus received commendable hike in its performance figures. To reach the desired target of ABT Audi S3 Saloon 2014, the auto tuner inserted new fenders that are made from high-quality ABS plastic. This integration doesn’t just add to the performance but also brings an additional badge to the looks of model. Apart from this in the interior of ABT Audi S3 Saloon 2014 they integrated changes like entrance lights, floor mats and air caps that bring to you a serene and special feeling while you are inside the ABT Audi S3 Saloon. Rounding up its entire work and to take its elegant monster over the street ABT gave the final touch through 18, 19 or 20 inch DR wheels finished in either Mystic-Black or Gun-Metal. 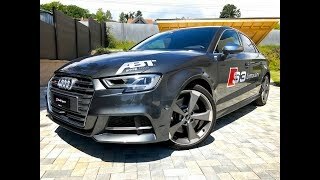 After introducing its newly designed techniques and giving the final visual looks, the ABT Audi S3 Saloon 2014 total output reached 370 hp and peak torque of 460 nm. This figure is well 70 hp and 80 nm above the standard version of Audi S3 Saloon. With its new power figures the ABT Audi S3 Saloon 2014 top speed touches the mark of 165 mph while is capable of knocking the 0-62 mph sprint in 4.5 seconds, which is 0.4 seconds quicker than its standard model.